How's your garden doing this year? We had a lot of rain and got our garden in late, then we got even more rain. Most of my friends had their gardens flooded out. Our garden plot is heavy in clay and loam soil, so it has excellent drainage. This means that I have cucumbers coming out of my ears. We've had sliced cucumbers or cucumber salad as a side dish for dinner every night for three weeks, and I've canned 40 pints of pickles for this winter. 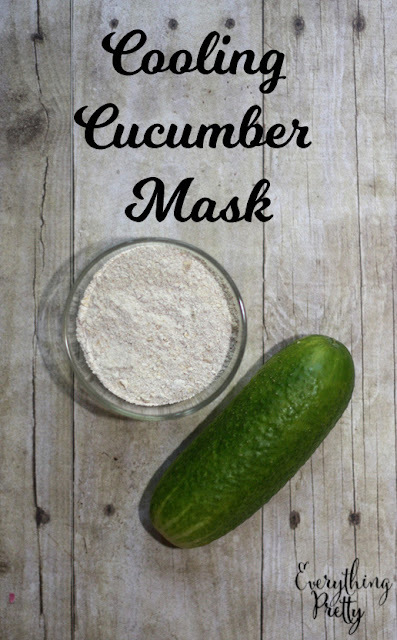 Naturally, I started looking for DIY beauty recipes like a cucumber sugar scrub and then I created this cooling cucumber mask. This face mask is great for sensitive or irritated skin. Cucumbers can reduce skin irritation by stopping pro inflammatory enzymes and preventing nitric oxides, which lead to inflammation. When applied to the skin, cucumbers can reduce inflammation and heat. They also cool and cleanse the skin. Oatmeal is also very soothing on the skin, so it makes a perfect complement to the cucumber. This post may contain affiliate links, which means that I earn a small commission from sales. Grind oats until they become a fine powder. You can also use colloidal oatmeal if desired. I used my blender on high, stirred, and blended again. Set aside. Cut the cucumber in to small 1/2" chunks. Puree in the blender until smooth. Combine ground oats and cucumber to make a thick paste. Spread on your face and let sit for 15 minutes. Rise with cool water. This mask feels amazing on sunburned skin! Do not use if you have a severe burn or peeling. You can store leftovers in the fridge for a day or two. Otherwise, discard leftovers.